One of my favorite items to layer with is a scarf. The scarf is one of the simplest pieces to carry with you to wrap around yourself when the air gets a little chilly or to take off quickly when you begin to warm up. I purchased this simple scarf from Forever 21 the same time I got this fun number. The pattern reminds me of the classic Pendleton blanket and I love the oversized fit. 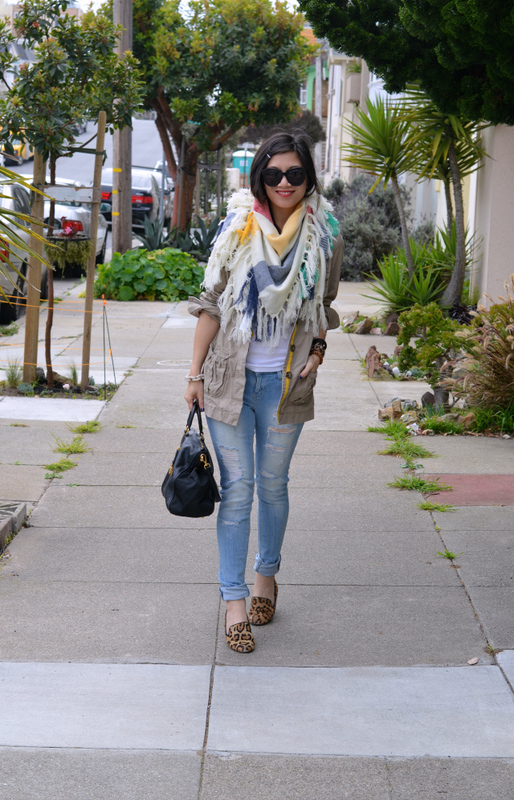 It feels so cozy to wear and with the slight winds we've had in SF, it definitely feels like it pays off. Scarfs are a must for me too! You look casual and very pretty! Oh that Prada tote is divine!! Love this! Those ripped jeans are awesome. Sometimes, I am very surprised at the things you can get at forever 21. This scarf is great! The pattern does remind one of a Pendleton blanket (in a great way! 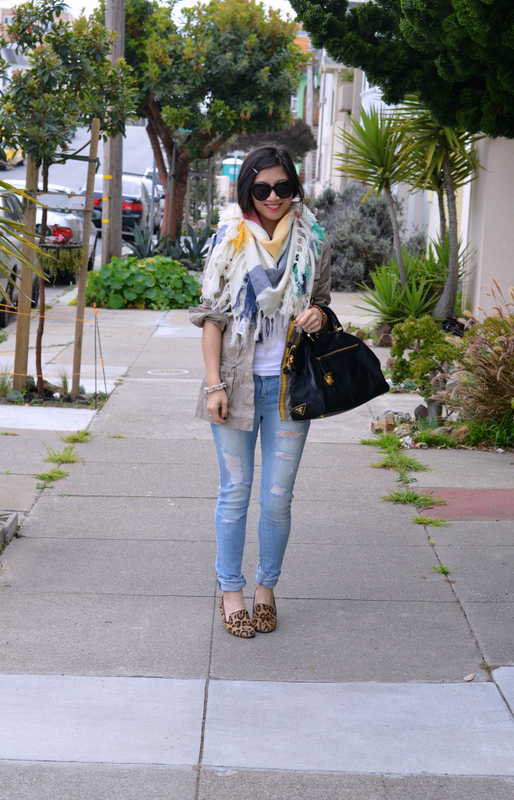 ), and I like how it is a simple outfit that allows the scarf to be the focal point. That scarf is so cute! Great look! I really love the colors in it! It's so pretty! Love the causal look on this outfit. The colors in the scarf is so pretty. I like the ripped jeans! 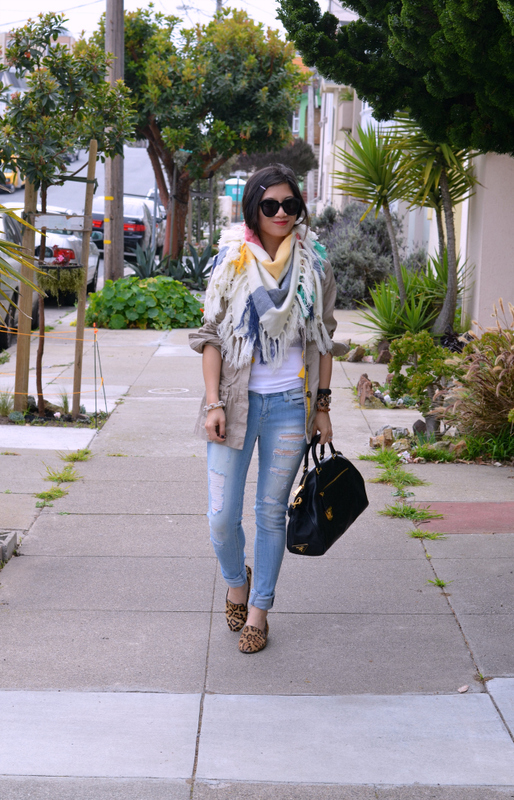 Yes to ripped jeans with flats! That scarf is ridiculously cute! I can't believe it's from F21!!!! I haven't been in forever... Must.Go.Now!